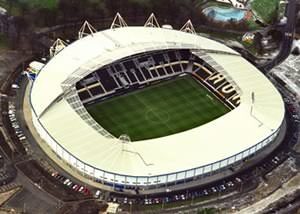 The Kingston Communications (KC) stadium was opened in December 2002, and is a real gem of a stadium! Build at a cost of £44m the KC Stadium is home to both the towns Rugby League & football clubs, and offers excellent facilities. Set in acres of tranquil parkland it offers a petting zoo, children's play area, boating lake, skateboard rink, sports arena, and there is even a cyber cafe, a college facility and a library! The stadium has an impressive all seater capacity of 25,404. The impressive design is a real masterpiece, and unlike many other new stadia, this stadium has an abundance of atmosphere, and quality. Like most new stadia, it's totally enclosed, with three single tiered stands, and one double tiered stand, which is obviously larger (this is the west stand). In a similar manner to Molinuex's curved stands, the KC Stadium is also unique in design. The roof of the stadium rises up and over the West Stand, and like Molinuex, the stands slightly curve around the playing area. The West stand also has a row of 28 executive boxes running between the tiers, and there is a an electric scoreboard at the North End of the stadium. Away fans are normally located within the North Stand, with an allocation of 4,000 for larger teams, and less for smaller teams. The stadium also has under soil heating, automatic irrigation system, and the turf has been especially designed - its real grass interwoven with a special blend of ...er stuff! Exit the M62 at junction 38, following the A63 and as you approach Hull the stadium is signposted. Continue along the A63, and as you approach the centre of the city, leave the A63, taking the second exit at the roundabout, following the signs for the Hull Royal Infirmary. At the traffic lights turn left, continue over the flyover, turn right at the next set of traffic lights, and the ground is on the right hand side. , and the stadium is approx 3 miles along on the left hand side. Paragon Station is a 15 minute walk from the stadium with a signposted pedestrian route using Londesborough Street. The stadium offers an Executive 'on-site' car park, and also additional parking in the Walton Street car park. Most of the home supports tend to use the town centre car parks, which are all clearly signed. The town centre is about a 10-15 minute walk to the ground. The area surrounding the ground is resident permit parking only, so unless you want a ticket, don't even think about it! There is an excellent Park & Ride facility located on Priory Park near to Sainsbury's. This is open on most match days, and is signposted from the A63 (Clive Sullivan Way). This service has spaces for up to 650 cars, offers a frequent bus service to the city centre, and picking up supporters after the game outside the stadium on Anlaby Road. Located on Princes Avene, a proper football pub with big screen sports - does have a reputation for trouble but should be okay except for local derbies etc. This pub is a ten minute walk to the ground. Located on the corner of Spring Bank and Princes Avenue, a family pub which serves acceptable food and also has big screen sports. This pub is a ten minute walk to the ground. Located on Spring Bank, recommended for away supporters. The Hole in the Wall - on Spring Bank, a real ale pub with big screen sports, excellent beer but no food. This pub is a ten minute walk to the ground. If you are a registered user then you can login, and create your own personal review of Hull City Football Club - The Kingston Communications Stadium. These reviews can be private or public.